Introducing a field study course within the Peruvian Amazon offered through the Biology and Sociology Departments at Albright College. 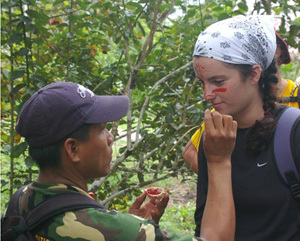 The course is designed to introduce the basics of ecological and anthropological field design. The exploration culminates in 10-day student projects within the Tahuayo-Tamshiyacu Reserve in the Amazon Basin of Peru. The Reserve is a communal (community-based) reserve comprised of tropical river, lowland rainforest, wetlands, and several native villages. Dr. David Osgood (Dept. of Biology) and Dr. Barty Thompson (Dept of Sociology and Anthropology) lead this course available for college credit or professional/personal development. Dr. Barton Thompson, Sociology/Anthropology Dept. This course introduces participants to the basics of field studies within the Anthropological and Ecological disciplines. 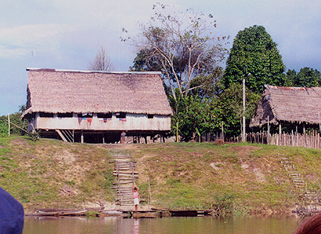 The study culminates in field study focused on a Communal Reserve in the Amazon region in Peru. Specific topics include techniques in biological surveys with emphasis on cataloging species diversity, habitat assessment, quantifying human influence, and evaluating efficacy of wildlife management techniques. Anthropological/Sociological methods include survey and demographic data collection, interviewing, direct observation and participant observation followed by methods of assessment including both qualitative and quantitative analysis. Participants will be required to propose and conduct group projects during the 10-day field component in Peru. This course is intended to serve as a Synthesis course or as an elective for Sociology/Anthropology, Environmental Science, Environmental Studies, and Latin American Studies majors. The course will be a combination of lecture and seminar format. 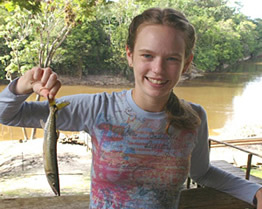 The culmination will be a 10-day field study on a Communal Reserve in the Amazon region of Peru. The on-campus component of the course will involve modules on the basic techniques of field study within ecology and anthropology/sociology. Students will be required to read seminal papers on field study within both disciplines. At least one model lab from each discipline will be conducted in the local area as practice for the field study abroad. During the field component, participants and faculty will visit the lowland rainforest area in the Tahuayo-Tamshiyacu Reserve within the Amazon River Basin. Amazonia Expeditions, a tour operator based in Tampa, FL will host our visit and we will stay in their award-winning Tahuayo Lodge. Amazonia Expeditions specializes in hosting academic groups and as such has a very individualized approach with highly knowledgeable guides. 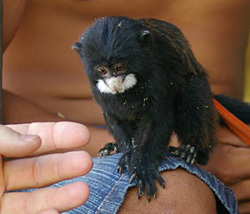 Please refer to the Amazonia Expeditions website for more details (www.perujungle.com). The Reserva Comunal Tamshiyacu-Tahuayo (Tamshiyacu-Tahuayo Communal Reserve) (RCTT) encompasses 322,500 ha of upland and lowland rainforest situated between the Amazon and Yavari Valleys in the State of Loreto. The Tamshiyacu and Tahuayo Rivers, both direct tributaries of the Amazon, are the two major rivers flowing through the RCTT. The RCTT was established in 1991 as part of a special category of protection (Community Reserve) defined by the Peruvian Government. A Community Reserve is a protected area where certain locations can have human habitation and regulated resource extraction by local populations can occur in designated areas. The RCTT was established in response to increasing natural resource extraction during the 1970s and 80s. The action to establish the RCTT was initiated by the local communities (described below) and researchers. These groups worked with the Ministry of Agriculture to establish a Reserve based on sustainable natural resource extraction by the local cultures. The RCTT is primarily comprised of upland (Terre Firma) and floodplain (Vï¿½rzea) forest interspersed with whitewater rivers (rivers laden with silt eroded from the Andes), small lakes, and lagoons (Coche). The flora and faunal diversity in this portion of the Amazon is particularly high owing in part to the area remaining forested during the Pleistocene epoch when other surrounding areas were converted to savannah habitat. There are a reported 14 species of primates in the Reserve area, the highest of any protected area in Peru. Additionally caiman, jaguar, peccaries and a large number of bird and insect species occupy the area. There are 32 villages within and around the RCTT with an approximate population of 6,000 residents. 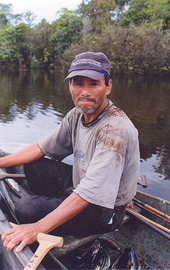 The residents are primarily a non-tribal people known collectively as Ribereños. Ribereños include detribalized Indians and a mix of European and African heritage many of whom still practice or have adopted native practices of resource use (fishing, hunting, shifting agriculture). The local population lives almost entirely from the resources in and around the reserve, which also includes lumber extraction and harvesting of natural fruits and nuts. Despite a general adherence to aboriginal land use principles, the amount of inhabited area and agricultural land has increased steadily throughout the region. Bodmer, R.E., J.W. Penn, P.E. Puertas, L. Moya I., and T.G. Fang (1997). Linking conservation and local people through sustainable use of natural resources: Community-based management in the Peruvian Amazon. In C. Freese (ed.) Harvesting Wild Species. John Hopkins University Press, pp. 315-358. Hiraoka, M. 1995. Aquatic and Land Fauna management among the floodplain Ribereños of the Peruvian Amazon. In T. Nishizawa and J.I. Uitto (eds. ), The Fragile Tropics of Latin America: Sustainable Management of Changing Environments, United Nations University Press, pp. 201-225. Puertas, P. and R.E. Bodmer (1993). Conservation of a high diversity primate assemblage. Biodiversity and Conservation 2: 586-593. Pre-trip Component: Class meetings will be held at Albright during the spring semester to provide background necessary for a successful and enjoyable field experience. Day 1 – flight from Newark or Philadelphia to Lima, Peru. Stay overnight at Hotel Melodia. Day 2 – flight from Lima to Iquitos (~2 hours). 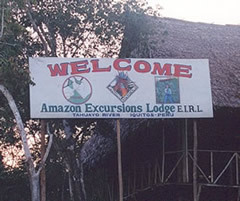 Travel by boat from Iquitos to the Tahuayo Lodge (~4.5 hours). Orientation at Lodge. Days 3-6 – participate in excursions (see below for examples) and hold daily afternoon meetings. Days 7-9 – Conduct student projects and hold daily afternoon meetings. Day 10 – Travel back to Iquitios, Lima, and Newark or Philadelphia. Lowland and upland forest hikes these hikes expose students to two very different forest ecosystems. The lowland hike takes place through forest that is regularly flooded during the rainy season with up to 5 meters of water from the river. The undergrowth is relatively sparse (but dense relative to temperate deciduous forest). Dominant trees include giant fig, Cecropia, palm, rubber trees and mahogany. The landscape is dotted with small semi permanent pools and several isolated floodplain lakes. Typical fauna include monkeys, caiman, tree-dwelling rodents, roosting bats, army ants, and several species of birds including toucan, aracari, and macaw. The upland forest is reached by boat up some of the tributaries of the Tahuayo River. The forest here is denser and contains a greater diversity of plants. The terrain is hilly and relatively dry. A significant amount of naturally-felled trees adds to the diversity as they are densely covered with epiphytes. 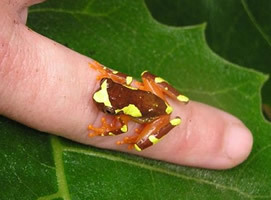 Typical fauna include termites, ground spiders, bullet ants, and the charismatic tree frogs. Forest Canopy zip line – Exploration of the upper rainforest canopy using a tandem zip-line system that is connected to several old-growth emergent trees located behind the Tahuayo Lodge. 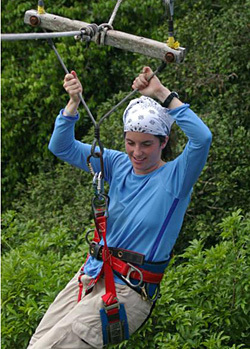 We will be mechanically hoisted about one hundred feet onto a platform located in the canopy of a large Ceiba tree. From the platform, individuals are then connected to a system of stainless steel aircraft cables, enabling easy movement from treetop to treetop. This will provide participants the opportunity to observe a wide variety of flora and fauna that cannot be seen from ground level. In fact, certain species of tree snakes and monkeys live almost their entire life in the treetops. Complete safety is assured; however, this is a completely voluntary activity. Canoeing – Using traditional dugout canoes, groups can navigate off the river into the flooded forest. Canoes are the only way to explore this unique area of dense undergrowth. One can stop and climb the giant prop roots of freshwater mangroves. Several fish can be heard feeding in the area, most of which are piranha. One can also travel by canoe to a lake or Cocha (local name). Unlike other waters in the area, swimming is safe in the lakes. The water is too deep for piranha and bacteria counts are low due to the antiseptic nature of the organics in the water. Pink river dolphin (Inia geoffrensis) are frequently observed during these excursions. Fishing is also optional typical catch includes peacock bass and piranha. Night excursions – groups can travel by boat on the Tahuayo River at night to observe nocturnal fauna. The boat travels upriver then drifts silently back to the Lodge. Typical sights include bats, night herons, nighthawks, Kingfisher, and owls. Caiman are also more active at night and can be observed along the riverbanks. Bird watching -early morning excursions by boat up and down the Tahuayo River is the best way to see the most bird species. On our excursion we observed black collared hawk, black great hawk, scarlet-crowned barbet, tropical kingbird, chestnut-eared aracari, yellow-ridged toucan, macaws, parrots, Amazon kingfisher, crimson tanager, and red-capped cardinal. Visits to local villages – groups travel to local villages (e.g. Chino or Santa Ana). We meet with the local population for a tour of the village and often a presentation by school-age students. Observation of villagers engaged in daily activity (fishing, food preparation, maintenance of facilities) is emphasized. Interaction with villagers is encouraged and facilitated through translators. Clear-cut Agriculture – Visits to small (~1-acre) communal agricultural plots provide illustration of local cultivation techniques. Typical crops include manioc, maize, sugar cane, and cocona beans. Typical practice includes weeding and harvesting by hand or use of indigenous substances (e.g. ground mushroom) as natural pesticides. The cost includes all airfare and ground costs including airport taxes, ground transportation, lodging and meals. Passport fees, vaccination cost and spending money for souvenirs and airport snacks are not included in the course cost. 1. No refunds available after March 1. Important: In the event of cancellation on the part of the participant after March 1 that participant is responsible for any unpaid balance amounting to the total course cost. Consult with your course instructors for information on making payments to the College. The only document required is a tourist passport. Two copies of your passport picture page are required in reconfirming flights and as entrance requirement for the Reserve. No visa is required. No vaccination certificate is required. In the 19 years that Amazonia Expeditions has worked in the region they have not yet had a traveler become sick with a tropical disease. There is malaria in the Reserve but we attempt to avoid regions at risk. The taking of malarial prophyllaxis is at your discretion. More details on travel immunization are available from Drs. Osgood and Thompson. Long and short pants; long sleeved shirts and tee shirts; rain gear; hat with brim; swim suit; sneakers and hiking shoes (jungle rubber boots in various sizes are provided on site), reef walkers or water moccasins can be helpful for canoe excursions. Daytime high temperatures are 80-88 F. Nighttime can get down to 60 F.
Sun block (close to the equator there is less atmospheric protection from UV); insect repellent (taking garlic and vitamin B1 helps); canteen or water bottle; flashlight with spare batteries; personal first aid kit; personal toiletries; daypack or small backpack. Binoculars; elementary school items to donate; camera (most underestimate the amount of film to bring); video (there is a generator for recharging batteries). Needed for some meals (2-3 meals in airports), tips, and optional purchases such as souvenirs. US currency is good for all of that, but make sure your bills are in virtually new or mint condition. Department of Biology Barton Thompson, Ph.D.